The H. Lieber Co. began its existence in 1854 as a bookbinding business and stationery store. The name of the establishment was derived from its proprietor, Hermann Lieber. Friedrich Hermann Lieber was born on August 23, 1832, in Düsseldorf, Germany, to Johann Richard Lieber and Clara Carolina Melbeck Lieber. Hermann and his younger brother Peter came to the United States in June of 1853. They initially resided in Cincinnati, Ohio. Hermann Anglicized the name by which he would be known in America by dropping the second “n” in his middle name. 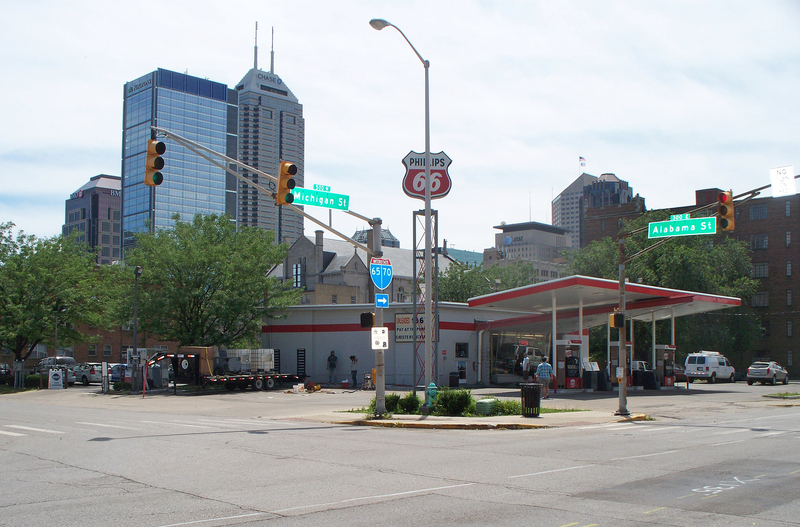 On a trip to Indianapolis in 1854, Herman became enamored of both the city and a young woman he met during his visit. Before the year was out, he moved to the Hoosier Capitol and set up shop. About a year after relocating to Indianapolis, Lieber married the young woman who had caught his eye, Maria Anna Metzger (1833-1904). Herman Lieber’s first shop was in a storefront at 3 East Washington Street. 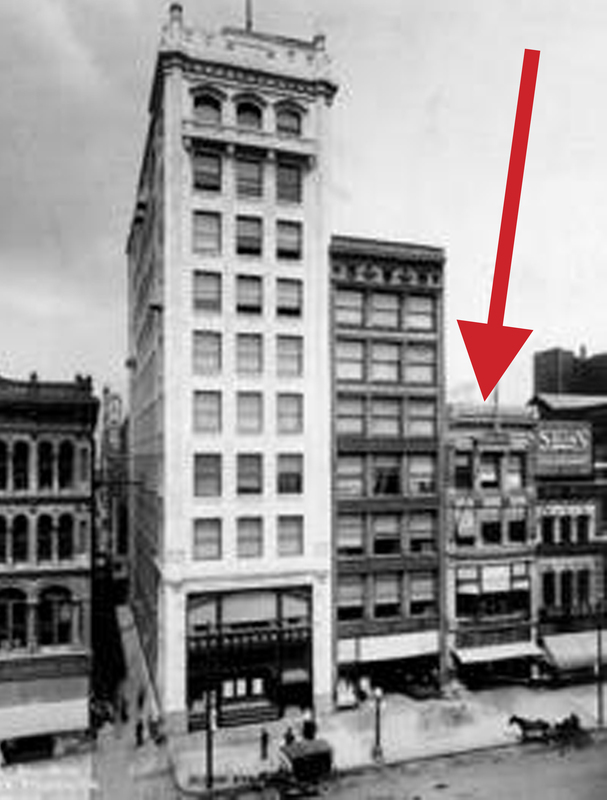 That location later became the site of the Merchants National Bank Building and now houses the law firm of Barnes & Thornburg. 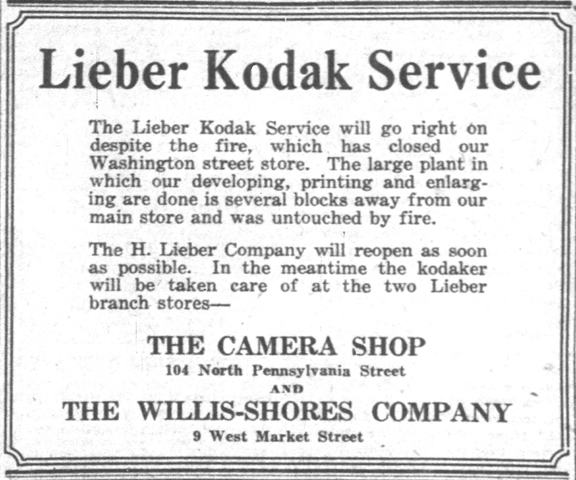 Lieber moved from the East Washington Street location soon thereafter and operated from 21 North Pennsylvania Street. 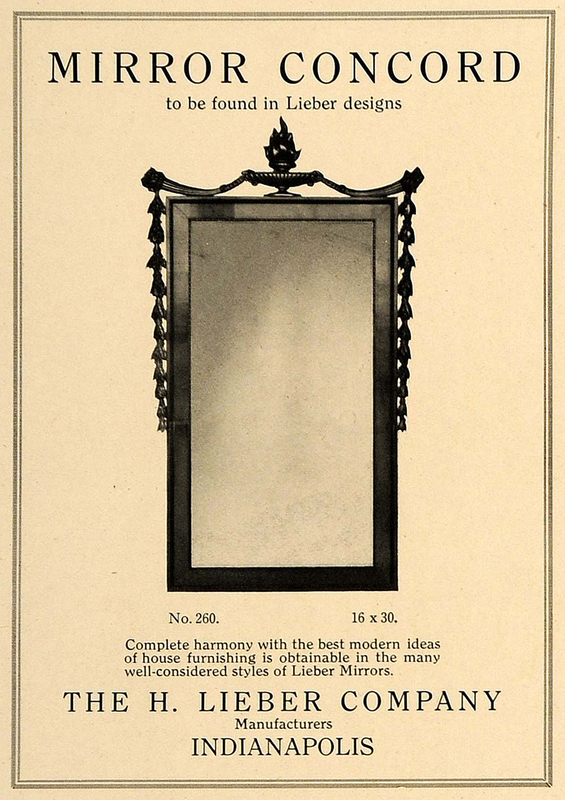 There the business’ original stationery and bookbinding activities evolved into picture frames, mirrors, looking glasses, mouldings, and artists’ materials. Around 1860, Herman Lieber built a home for his wife Maria and their two daughters, Bertha and Emma, at 123 North Liberty Street. Liberty Street was later renamed Park Avenue, and their house was renumbered from 123 to 407. Today the former Herman Lieber residence at 407 North Park Avenue is part of the Lockerbie Square Historic District. In 1863, Herman, his brother Peter, and their friend Charles Mayer purchased the Gack & Biser Brewing Company and renamed it the P. Lieber Brewing Company. P. Lieber beers were bottled by Jacob Metzger, who was the father of Herman’s wife, Maria. Herman eventually sold his interest in the brewery, once the company was on its feet. The company later merged with other local breweries and became the Indianapolis Brewing Company. You can read more about the Liebers’ brewing companies in a 2011 “Sunday Adverts” piece here. During the next decade, six more children were born to Herman and Maria Lieber, including Otto, Ida, Carl, Anna, Robert, and Herman. The increase in number of family members necessitated a larger home. 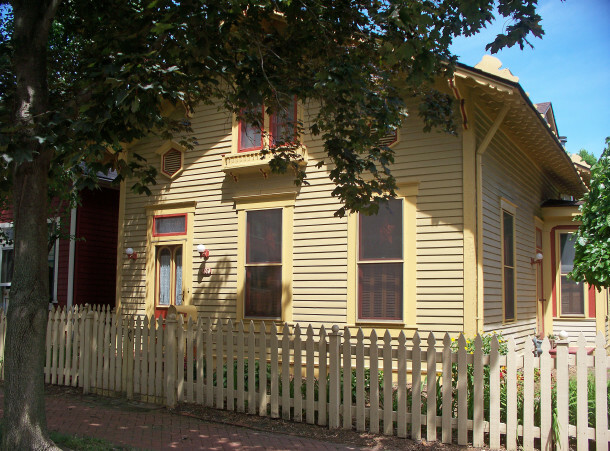 In the late 1860s, Herman built a 2-story brick home at 404 (now 802) North Delaware Street. In the early 1880s, he built yet another home at 250 (now 484) North Alabama Street, where he lived for the remainder of his life. Both the Delaware and Alabama Street homes were replaced by commercial structures years ago. 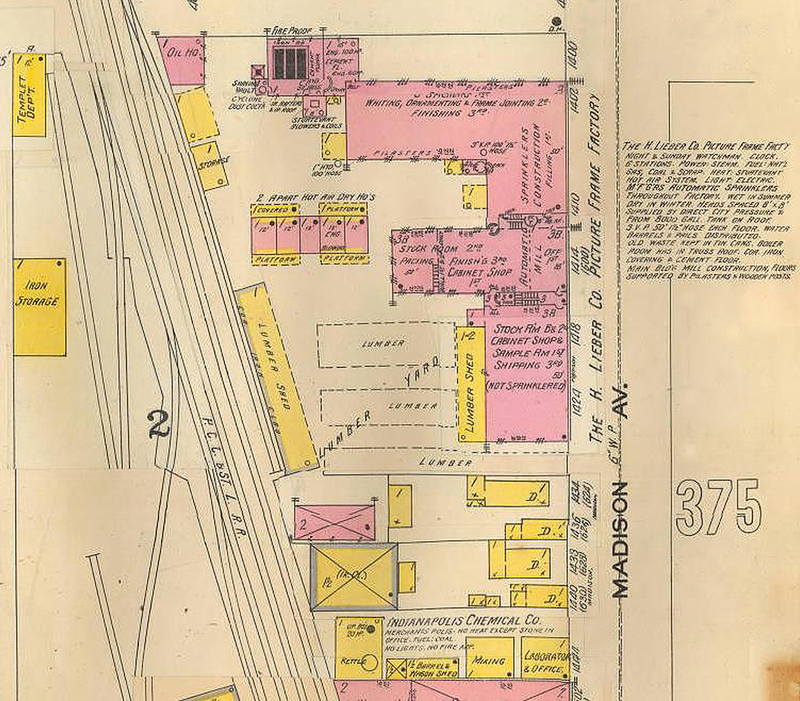 When the manufacture of picture frames and mouldings outgrew the space available in the store, the H. Lieber Co. built a factory for their manufacture at 800 (now 1400) Madison Avenue. The factory was constructed alongside the Pittsburgh, Cincinnati, Chicago & Saint Louis Railroad (P C C & S L RR) tracks for the easy delivery of lumber and glass. 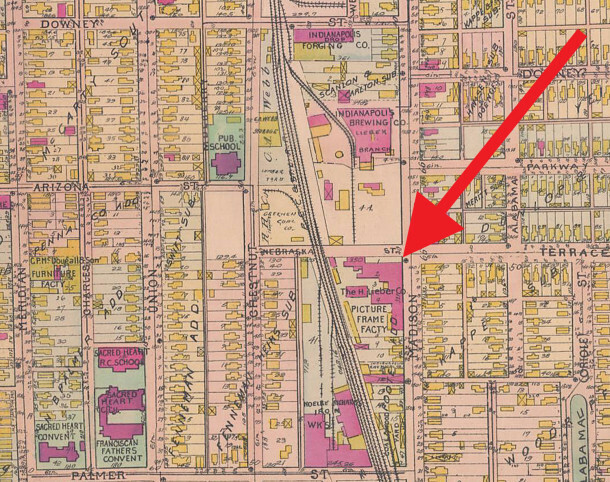 The buildings that Lieber erected on a pie-shaped wedge of land stood for more than a century. After their demolition in about 1998, the corner remained unimproved until recently, when a controversial mixed-use project called Madison Apartments and Shoppes was built by the Keystone Group. In 1900, H. Lieber Co. became one of the first exhibitors of paintings by the Hoosier Group. The Hoosier Group was a loose association of Impressionist painters working in Indiana in the late 19th and early 20th centuries. 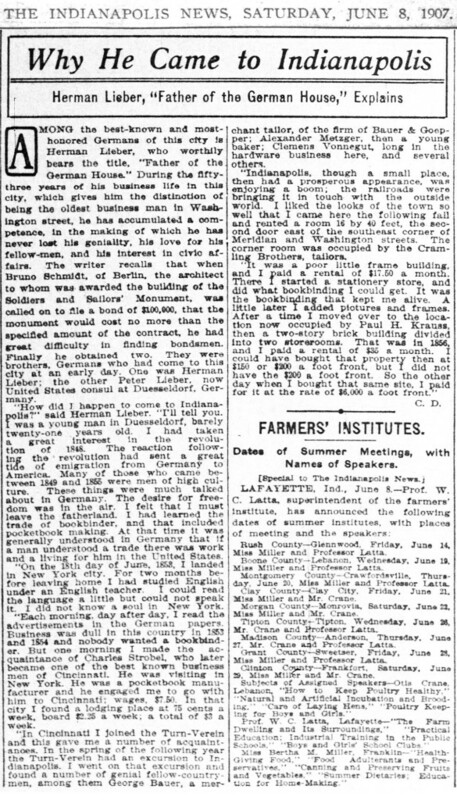 Members of the group included T. C. Steele, Richard Gruelle, William Forsyth, J. Ottis Adams, Otto Stark, and Samuel Richards. They are best known for their paintings of Indiana landscapes. 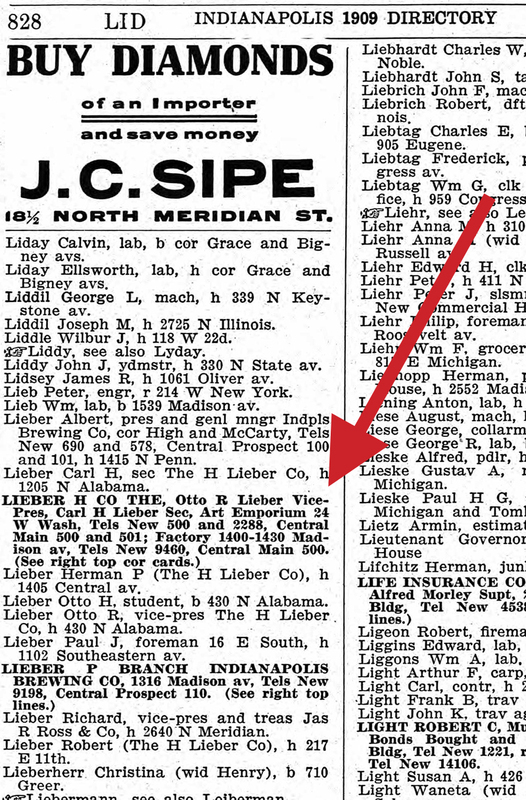 In 1902, H. Lieber Co. incorporated as a retailer of paintings. The gallery was called the Art Emporium. Herman Lieber was a civic leader and involved in a wide variety of activities. He was especially interested in the German activities of the period. He was a co-founder of the German-English Independent School. He gained the nickname of “Father of the German House,” because he had been one of the strongest proponents for the construction of Das Deutsche Haus, as well as one of its greatest supporters after it was built. He was active in a number of Turnvereins and was president of the North American Gymnastic Union. Herman Lieber died on a train near Flagstaff, Arizona, while en route to a vacation in California. His body was accompanied home to Indianapolis by his daughter, daughter-in-law, and two of his sons. It lay in state at the Athenaeum for a day before the funeral was conducted there. He was buried in Crown Hill Cemetery, alongside his wife, who had preceded him in death, and their two oldest daughters, who had died in childhood. Upon his death, H. Lieber Co. was inherited by Herman’s sons, Otto, Carl, Robert, and Herman. 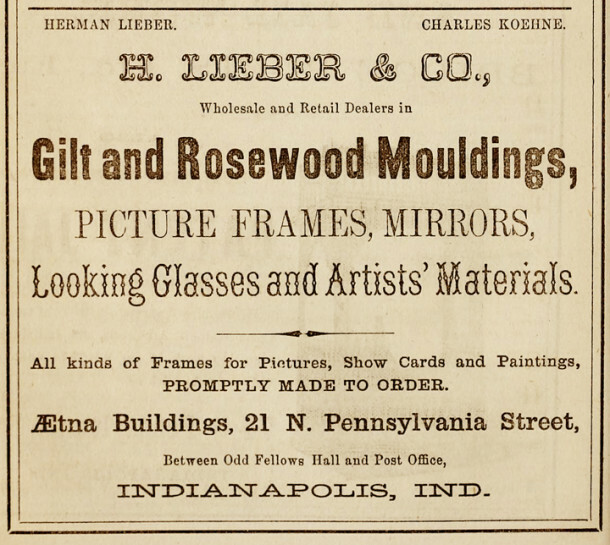 As photography gained wider usage, the Liebers did less and less selling of picture frames and mouldings and more and more selling of photo supplies and photo finishing. The Art Emporium closed in the 1950s, and H. Lieber Co. focused on its photo-related sales and services. 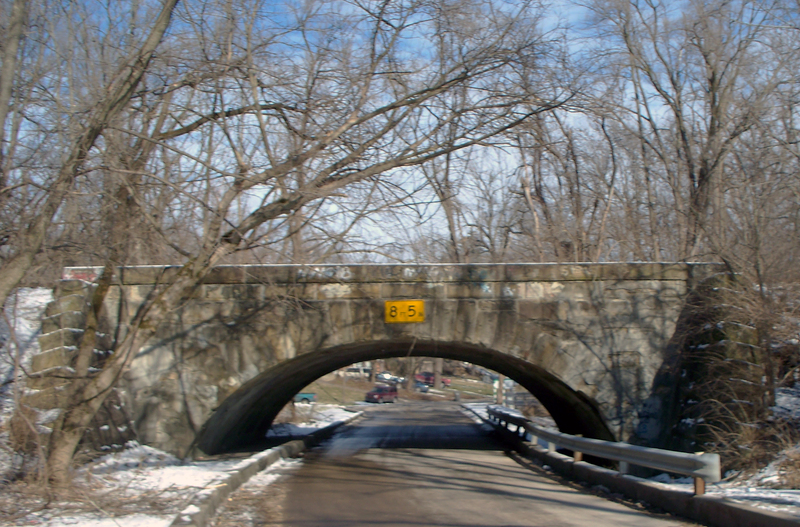 At its height, there were five locations around town. In 1920, a fire gutted the H. Lieber Co., resulting in a loss of approximately $200,000. 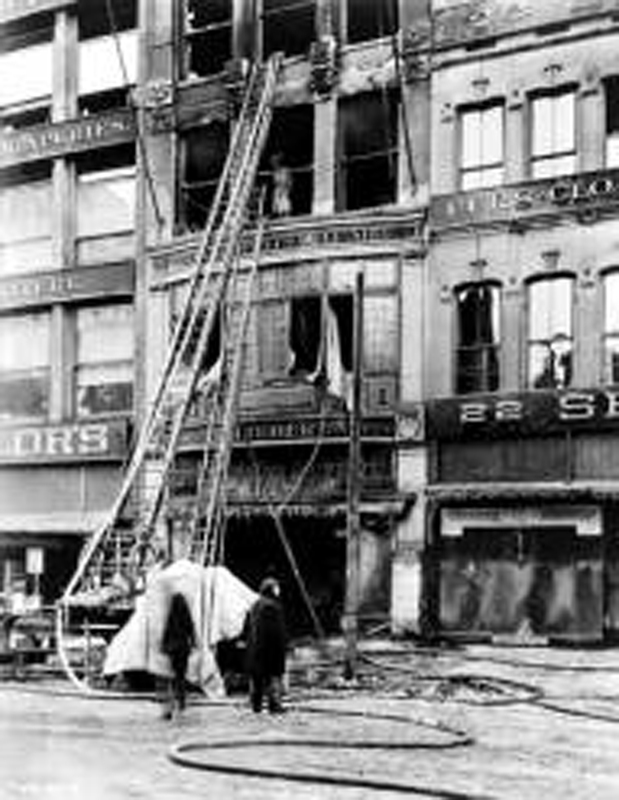 The Liebers temporarily operated from two other nearby locations, while 24 West Washington Street was rebuilt. The H. Lieber Co. closed its doors in 1979, after a 125-year run. Its assets were acquired by Hook’s Drugs, which later sold the photo division to Hoosier Photo Supplies. 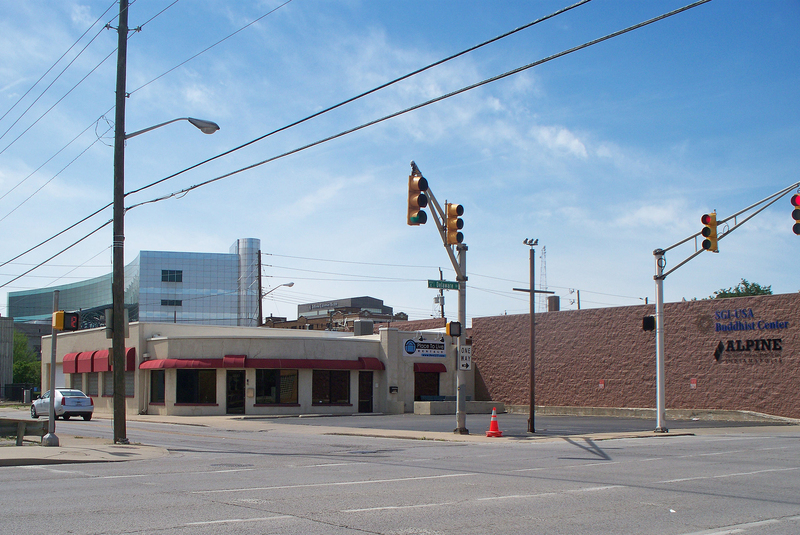 The final H. Lieber Co. store was located at 440 North Capitol Avenue. That block is now the site of a new development called Block 400, which contains the 487-unit Axis Luxury Apartments, a Marsh Supermarket, and a 930-space parking garage. 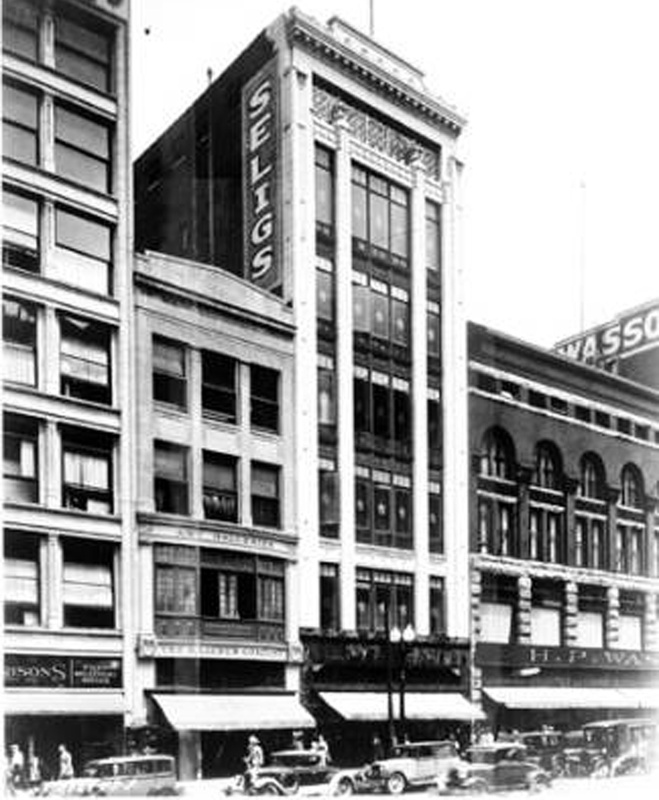 The building in which the H. Lieber Co. was located the longest is still standing today. 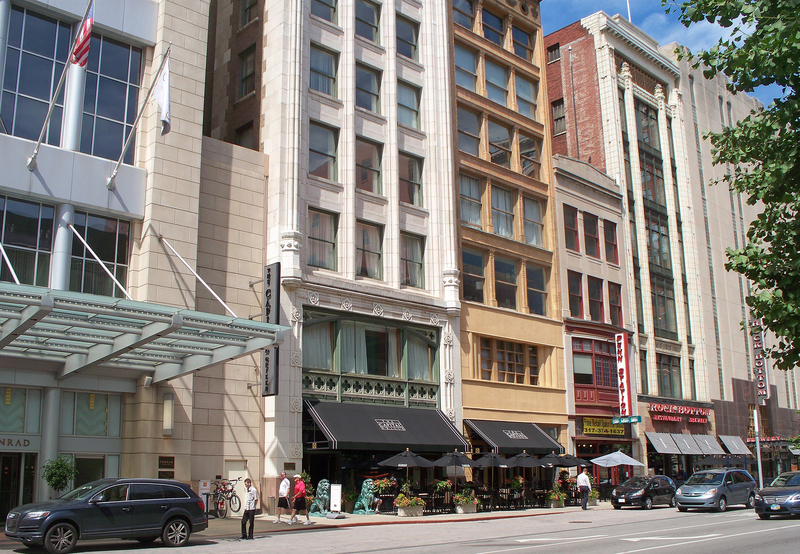 The Liebers and their extended family members were important figures in the early growth of both the City of Indianapolis and the State of Indiana. 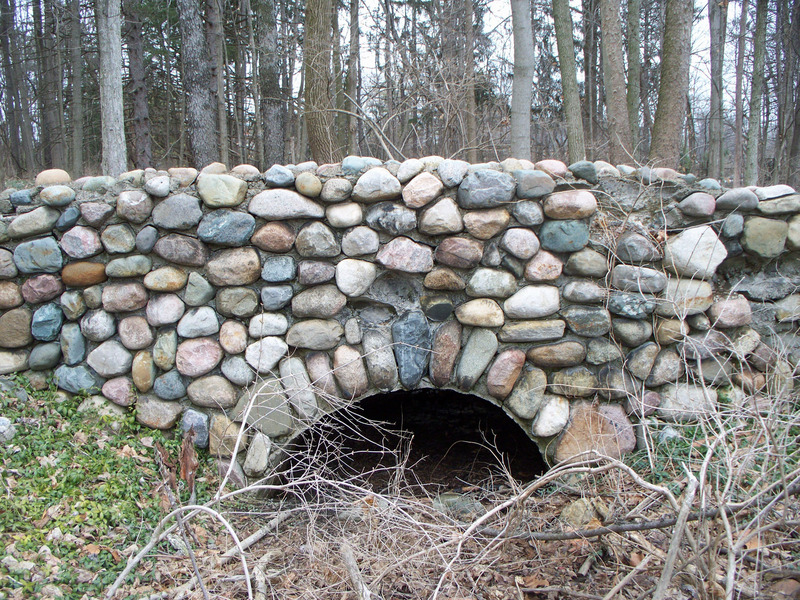 As an example, Herman’s nephew, Richard Lieber (1869-1944), is considered the father of the Indiana State Parks system. Herman’s son, Carl H. Lieber (1866-1929) was one of the founders of the Art Association of Indianapolis, which spawned the John Herron Art Institute and the Indianapolis Museum of Art. The descendants of brothers Herman, Peter, and Otto Lieber are still among us today, making their own contributions to Indianapolis, to Indiana, and to points beyond. Lieber-related families’ surnames include Adams, Bachman, Barus, Birge, Buschman, Cassell, Glossbrenner, Kothe, Metzger, Pantzer, Pfaff, Rappaport, Ryan, Shubrick, Siebert, Stempfel, Stewart, Traub, Vonnegut, and Walsh. The Liebers continued their civic involvement well into the latter part of the 20th Century. Bill Lieber served on the Indiana Natural Resources Commission for a number of years. There is a Natural Resources site named for him in northern Indiana. He was also quite active with Planned Parenthood. Thank you for adding some information about a Lieber in a later generation. As I noted at the end of the article, there were (and still are) Liebers and Lieber relatives who have made great contributions to our city and state. I am fortunate to have known several of them personally. 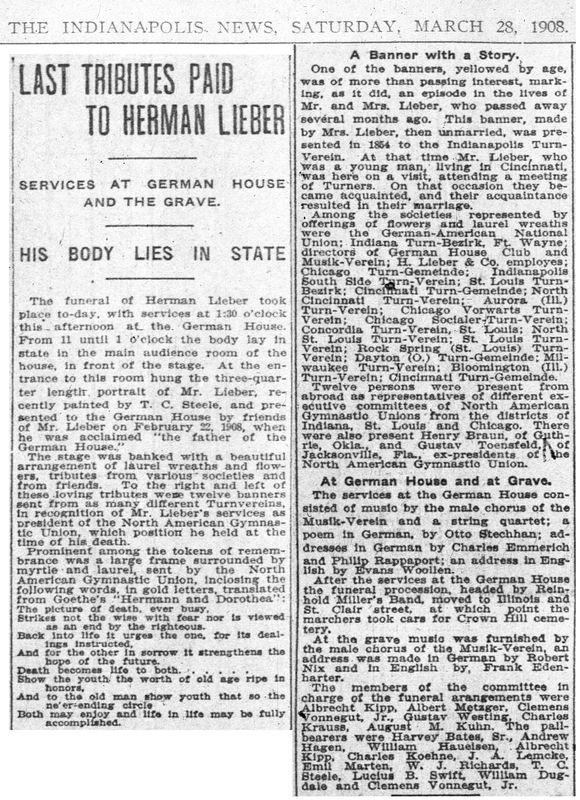 The above is a link to the Find a Grave photo of Herman Lieber’s monument. Great article as usual, Sharon. 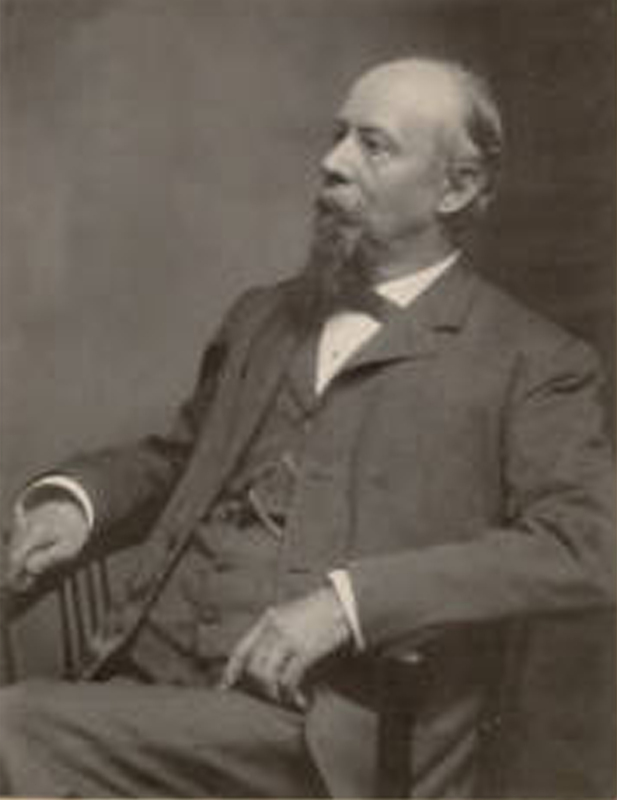 Herman was also one of the original founders of Crown Hill Cemetery. His daughter Ida married Henry Kothe. The Kothe monument near the northeast corner of Section 15 is draped with a bronze palm branch not unlike the large bronze quills on the Lieber monument. Daughter Anna married Theodore Stempfel, who coincidentally has one of the larger monuments in the same section (44) as John Dillinger. I’m not sure, but the bronze pieces are likely the work of Rudolph Schwarz, who did many of the sculptures around town, including the statue of Morton outside the state capital, and the large groups of figures on the east and west sides of the Soldiers and Sailors Monuments. He also did the reposing figure on the monument of Albertina Allen Forrest at Crown Hill and both Herman’s son Carl and his son-in-law Theodore had tried to help him in his career. Thank you for pointing out yet another accomplishment of Herman Lieber. He was involved in so many different facets of the community, it’s hard to mention them all! Certainly the establishment of Crown Hill Cemetery was an important event in the history of Indianapolis. The latest renovation of the building in about 2002 included preservation of some elements of the several versions of the interior on the first and second floors, even inside Penn Station. The outline of the several gallery rooms, with some old finishes, are preserved on the second floor. The second and third floors remain undeveloped, in the same empty state from when The H. Lieber Co. closed. Thank you for the fire photograph, which I had seen before but misplaced. I believe it was following this fire that the Washington St. façade was made simpler, in today’s form, except for maybe the second-floor window arrangement. 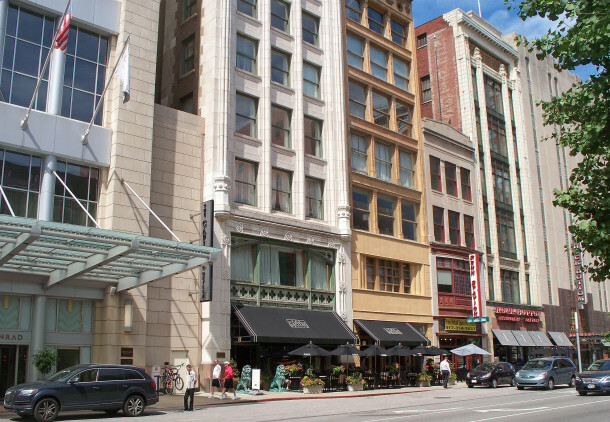 John, Thank you for your stewardship of 24 West Washington Street. It’s because of owners like you that we have anything left of our city’s history. May your example help others to see the value in preservation. Lieber’s published a small magazine called “Lieber’s Photo News” in the 1920s and ’30s and maybe later. I’ve only seen a few issues but would like to find more, since I’m compiling a directory of Indiana photographers. Does anyone know of issues in libraries or private hands that I could view? Joan, the Indiana State Library has at least one issue, Call Number ISLI 770 L716, but it may be an issue you’ve already seen. I wonder if any were passed on to Hook’s Drugs or Hoosier Photo Supplies, when those companies acquired the H. Lieber Co.’s assets? The president of Hoosier Photo at the time it ceased operation was named William A. Boncosky. If you’re not bashful about contacting him, his land line phone number is listed. I have a small picture frame that was my great aunt’s who lived in Indianapolis. It has the H. Lieber Company seal on it. How can I find out how old it is? The H. Lieber photo finishing was on the third floor of the 440 N. Capitol address when I worked there in the 60’s. All of the Hook and Haag drugstore photo finishing ended up at that location. I have some pleasant memories from three summers working at Lieber. They paid everyone in cash. I still have several pay envelopes and hand-written pay slips. Despite the hand-written books, they managed to get my earnings recorded for Social Security. Several times I went to the Fourth Floor, where business records were kept. It was something like turning back to a 1920’s or earlier period. I recall a skylight and a bank-like teller cage environment with a huge safe in the background. It was eerie and totally anachronistic. Thank you for your reminiscences, William. It’s interesting to have a glimpse into H. Lieber’s operations from someone who worked there half-a-century ago. I have an unsigned oil painting which I believe might have been purchased at the Art Emporium sometime between 1921 and 1928. The painting has a very Brown County feel to it. It belonged to a well known Indianapolis attorney and legislator. It is in its original frame which has on it what I believe might have been the Lieber mark. It is the letter “L” inside a diamond shaped box. Do you know whether any sales records exist from the Art Emporium? Thanks for the wonderful information and photos. Frederich Hermann Lieber is my great great grandfather. Thank you for leaving a comment. If my research is correct, you are descended from Herman and Maria Lieber’s daughter, Anna, who married Theodore Stempfel. Quick question: you mentioned that “Around 1860, Herman Lieber built a home for his wife Maria and their two daughters, Bertha and Emma, at 123 North Liberty Street. Liberty Street was later renamed Park Avenue”. Do you have an approximate date for the change of name from Liberty to Park? I have a painting with the “The H. Lieber Company Indianapolis” seal on the back. Where would I go to identify the artist? I can’t make out the signature. I have an inventory number. Hello, I recently purchased an old school bell , the seller told me the bell came from the Lieber Estate. How would I find out more about this bell? Good question! I’m not sure. Perhaps by tracking down some Lieber family members? I have a small framed painting with the “The H. Lieber Company, Indianapolis” seal on the back. Where would I go to identify the artist? Are there records kept of individual work orders? They went out of business many, many years ago and without an artist’s signature, I’d try to find a local art dealer who specializes in Hoosier artists. Someone like Curt Churchman, off the top of my head. Tiffany’s suggestion of contacting Curt Churchman at Fine Estate Art & Rugs is a good one. If the painting was by an Indiana artist who created ver many pieces, Curt might recognize the artist’s work immediately. You might also contact the Hoosier Salon. Another idea might be to go to the Indiana Historial Society and look through their archives. There are at least three Lieber collections at the IHS, which were donated by family members. The Herman Lieber Collection might list some of the artists whose work he sold. A third suggestion would be to try to contact living descendants of Herman Lieber. It’s a long shot, but you never know when a descendant might be in possession of inherited materials. Besides the Lieber surname, descendants’ of Herman Lieber known to me include surnames of Kothe, Birge, Julien, Baker, Hoffman, Stempfel, and Kinnaird. There are undoubtedly others. My name is Dennis. I live in San Diego California. I have 2 photos with the H. Lieber Co. logo on the back. I don’t remember where I found the photos. I was wondering if you can tell me a little bit about them. There is a note on the back of one that says Uncle Elmer Townsend 4th Lower Right about 1912. Could you please get back to me as soon as possible. It would be greatly appreciated. Thank you for that fascinating material. John Mulvany, the painter of Custer’s Last Rally wrote to Lieber in 1904 asking Lieber to show his painting, “The Striker”. Lieber declined but I wonder if a copy of the painting exists in the Lieber papers, if you had any advice on how to pursue this, I’d be very grateful.